With the 2015-16 season quickly approaching, there has been a lot of talk about which team is the best “bet” to win the National Championship next year. After a trip to the Rose Bowl and National Championship last year, it seemed that the Ducks were on their way to a new level of recognition among college football fans. However, Vegas and sports analysts alike still do not have Oregon as their choice to win it all next year. In fact, Ohio State is the most favorable team for next season. Despite their success throughout history, the Ducks still fail to reach the level of prestige that teams such as Ohio State and Alabama have. Many critics argue that this is simply because the Ducks have yet to win a National Championship game. The reason, however, is not that simple. National Championship titles, as important as they may be, do not make a team a powerhouse. Autzen Stadium Ducks vs. South Dakota. A successful football program is not made up of only players and staff. They are the starting point, but it takes the overall image of the team and the fan base to take the program to the next level. Programs that have large followings are often rooted for in tradition within associated families. They have traditional uniforms, mascots, and the way they go about playing football. Oregon does not fit the traditional mold. Oregon is the team that wears a new uniform every game and is constantly evolving in order to become the best team they can be. 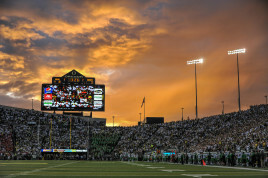 Oregon strives to have a tradition of innovation, so many fans who follow traditional football programs dislike this. The fact that Oregon’s style does not blend well with other teams often makes it hard for critics to take it seriously. Former Oregon Ducks Coach, Chip Kelly. 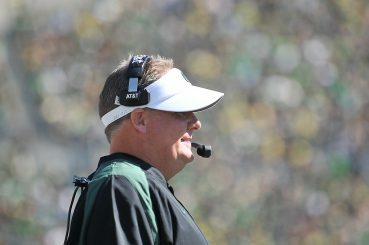 Chip Kelly brought the Ducks more attention by taking them to a BCS game all four seasons of his career. The Ducks have been on a steady incline since Kelly’s days as head coach. Many worried that when Kelly left, the Ducks would lose momentum. Mark Helfrich helped the Ducks to continue pushing toward the goal of a National title. Helfrich also brought depth to the Oregon team by placing more emphasis on the defense and working closely with defensive coordinator, Don Pellum. 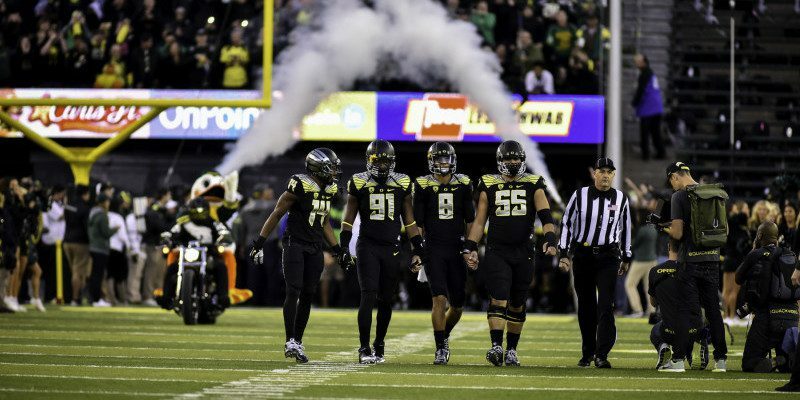 Oregon’s defense helped the team to a number of victories in the 2014 season. This next season will be the first season since Marcus Mariota left for the NFL. Mariota was not only a solid quarterback, but also a true leader for the team. Since the quarterback spot for the Ducks is still undecided, many critics are curious to see how the team will play with a new quarterback. Many people are hesitant to put their faith in a team that could realistically go with an untested QB. When Oregon football came into the spotlight, many people formed an opinion on what kind of team it was. Oregon got labeled as fast and was not really seen as a heavy hitting team. Thanks to their use of the spread offense, they were able to push past many successful defensive teams. This type of offense is not well-known but has recently spread to other teams. Ohio State is also a big supporter of this type of offense, which is why the match-up between the two teams got so much attention. Oregon lead Arizona 23-0 at halftime in Levi Stadium. The qualities that make Oregon unique and effective are often the very ones that turn people against them. Their use of innovation and speed make them seem less dependable to people that have grown up with the “traditional” teams. 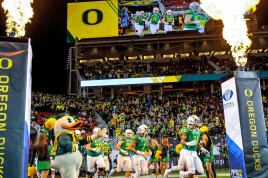 It may take the Ducks winning a National title for the team to gain the recognition they deserve. Regardless of that, Oregon will continue to make it a point to succeed their way, even if it does not fit the traditional mold.